Transportation contributes to about 10% of the carbon emissions of India’s energy sector.1 Road transport contributes to more than 90% of these transport emissions and is also a major contributor to increasing urban pollution. To achieve a low-carbon future and livable cities, India must transform its urban mobility. The future of global urban mobility is electric, shared, connected and autonomous. 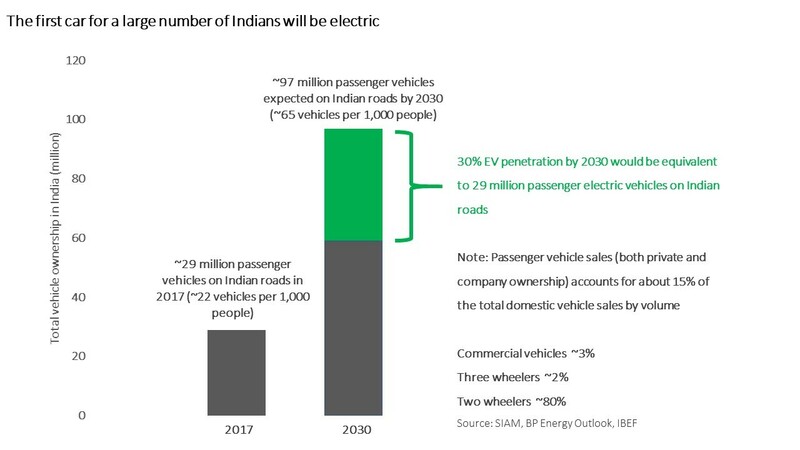 In the Indian context, shared mobility has recently come onto the scene, and electric mobility is knocking on the door. But there hasn’t been a serious discussion about connected and autonomous mobility. Paradoxically, India is yet to procure much of its vehicle fleet. In other words, there’s an extraordinary opportunity for investments in the future of mobility. Business model innovation in India is driving growth in shared mobility and is based on readily available and affordable internet and communications infrastructure. This is why we’re seeing such massive uptake in ride sharing across major Indian cities. But to reach the same scale, electric vehicle (EV) adoption will require extensive public and private investments in manufacturing, technology deployment and charging infrastructure creation. There is wide consensus in the automobile industry that a policy roadmap and strong coordination between different departments of the government will help guide the industry and facilitate investments for electric vehicle adoption. This is why the stakeholders in the EV industry are encouraging the government to play a critical role during its formative years. Given the long product development lifecycles for EV, new investments can’t be postponed for too long if India is to see a smooth transition to EVs across different parts of the automobile value chain. Indian policymakers can learn from the initial EV adoption experience of the US, Europe and China - but it may be difficult for India to replicate their strategy. Given the country’s socio-political context, it is likely to be both politically challenging and unreasonably expensive for India to subsidize millions of private vehicles. However, the cost of doing nothing or waiting too long can also be extremely high. How can policymakers address this challenge? However, the government’s ability to create demand through own procurement has its limits and private adoption needs to be ramped up to attract investments. The good news is that EVs are already economically viable if usage per day is between 100-200 kms (about 2-4 times the length of New Delhi), depending on the vehicle type and cost of electricity. Business can bring uptake to the next level. This is because companies and fleet owners typically have higher utilization rates than individual customers and are well-placed to derive economic value from electric vehicles today. As such, business can bridge the gap between initial government adoption and subsequent mass adoption. Companies like Wipro and the State Bank of India are already taking a lead by joining The Climate Group’s EV100 initiative for accelerating the roll-out of EVs in India and worldwide. EV100 is a global initiative bringing together forward-looking companies committed to accelerating the transition to electric vehicles (EVs) and improve the availability of charging infrastructure, making electric transport the new normal by 2030. Together, this will accelerate a much-needed shift in the market, bringing down costs to make EVs more accessible for all. How can the government support corporate adoption? To support business and fleet adoption, India can offer targeted incentives for consumers with high vehicle utilization rates and make it easier for them to switch to EVs. For example, EVs can be allowed partial or fully waiver of the following: vehicle registration charges, fee for commercial permits, state level entry tax on commercial vehicles, environment tax for freight entry in cities like Delhi and highway toll collections. Such waivers, once enforced, offer more predictability than a subsidy mechanism where payment delays and/or intermittency can creep in due to lack of funds. Accelerated depreciation for businesses, lower cost of finance and feebates can also be considered to support business adoption of EVs in India. States such as Andhra Pradesh6 and Maharashtra7 have already moved in this direction. There is a keen interest from the private sector to invest in EV charging infrastructure across the country and competition can help create this infrastructure in a cost-effective manner. Public capital can be used more judiciously to just bridge the viability gap for such private investments. To enable private investments, the government should address existing regulatory restrictions that allow new business models and enhance competition. One way they could do this is through removing elaborate licensing requirements for selling power for vehicle charging. Like EVs, charging infrastructure will also requires higher miles travelled to achieve commercial viability. Regulations must allow private charging infrastructure to service the public as well. Additionally, public infrastructure must be created in coordination with the private sector, especially around important business districts. To achieve the environmental benefits and lower the cost of charging, use of on-site and off-site renewable power and energy storage should be supported under the respective policies and missions. India is an emerging market for EV adoption. It will face common global challenges and can learn from global best practices as they evolve. However, local and India-specific challenges and issues must also be carefully understood and addressed. Understanding and resolving issues faced by pilot projects in such a way that the same issues are not faced for future adoption is probably as important as any new policy announcement. Switching from combustion engine to electric is probably one of the biggest transition of our lifetime. There is a lot of inertia to be overcome, and it will not be easy, but we have to try.